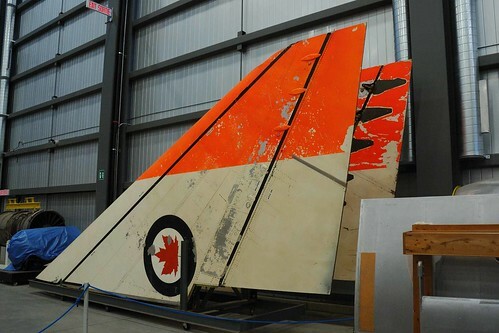 Surviving wing tips of the Avro Canada CF-105 Arrow, Storage Wing, Canadian Aviation Museum, Ottawa, Ontario, Canada. Flickr: DSC_4420, originally uploaded by GRB_Ott. We have all heard the Avro Arrow mythology promulgated for the public. That the Canadian division of UK-owned A.V. Roe and Company was contracted to provide a supersonic delta-winged interceptor; that an interceptor of unprecedented capabilities was built, and flight tests begun; but then the American military-industrial complex and unconscionable perfidy from the Prime Minister of the day (John Diefenbaker) conspired to kill the wonder jet so that money would be made, political ambitions furthered, et cetera. The power of the mythos is such that a 1997 made-for-television movie featuring Dan Akroyd was crafted with this storyline. Problem is, the tragic fable is almost entirely false. That Diefenbaker ordered the destruction of all program materials to prevent it from ever being resurrected. That the Arrow was so far ahead of its time, we would still be flying them today; also that we would not have bothered to buy four other fleets of foreign-designed aircraft (CF-101 Voodoo, CF-116 Freedom Fighter, CF-104 Starfighter, CF-188 Hornet). I’ll try and summarise Colonel Larsen’s article here, but you’d be well-advised to pick up the magazine and read it, if you want the facts in greater detail. Although PM Diefenbaker made the official announcement on February 20th, 1959, the federal Cabinet made the decision, and it came after five months of deliberation—which was in fact initiated by a recommendation from the service chiefs of the Canadian military. The minutes of that August 1958 Cabinet meeting are available at DFAIT’s website, and they clearly indicate that the program costs had escalated to the point where “the Chiefs of Staff felt that, to meet the modest requirement of manned aircraft presently considered advisable, it would be more economical to procure a fully developed interceptor of comparable performance in the U.S.” In other words, the RCAF didn’t want the Arrow, and had already determined that its support and logistics costs outweighed its potential military value. For what it’s worth, I have read elsewhere that the previous St. Laurent government had also decided it would kill the Arrow, had it been returned to office in the 1957 federal election. Documents declassified in 1990 indicate that the Chief of the Air Staff (CAS), Air Marshall Hugh Campbell, was the source of this direction. Normally the Department of Defence Production (DDP) had six months to dispose of program materials to other government departments, research centres, and scrap. A memo from G/C Ray Footit (signing for CAS) to DDP ordered that everything was to be cut up before being sold as scrap, and that no major components were to be sold as intact entities. Myth 3: The Arrow was extremely advanced for its time, we’d still be flying them, and would not have bothered to buy other fighters. The best way to answer this is to use Col. Larsen’s chart that accompanies the article. It compares performance data from several aircraft designs of the time. The F-106, incidentally, remained the backbone of USAF’s interceptor fleet until replaced by the F-15 Eagle. As Col. Larsen makes clear, the Arrow died because of multiple factors. The RCAF had already accrued some bad experiences with the Avro-built CF-100, and they didn’t like the support they were getting from the company on that product. The RCAF’s senior brass very much doubted whether Avro could build an even more complex aircraft and still make it reliable and easy to maintain. Unfortunately, Avro’s CF-105 prototypes were not built with ease of maintenance in mind; in one case it would take 70 hours to inspect a part whose inspection interval was only 50 hours. In other words, every two days’ flying time you had to ground the plane for three days in order to inspect the part. And that’s for a brand-new airplane, where most things should not be breaking too often. Imagine what would happen once that airframe had been in service for 10, 15 or 20 years. The Arrow would have been a ramp queen par excellence. Worst of all, in just four years the Arrow’s program budget nearly doubled (going from $261 million to $400 million) while completing only five percent of the scheduled flight tests, and the radar/fire control system had yet to be installed, let alone tested. In 11 months the Arrow racked up only 80 hours of flight test time, while the F-106 managed to conduct 1,000 hours of flight testing in a year. All our national myth-making aside, when you add up all the things that went wrong, the Arrow was a weapon system doomed from the start. Thanks to Colonel Larsen for his bracing deconstruction of the Arrow mythos; if this is a subject that interests you, you ought to pick up the magazine and give it a read. Chris, this is a really outstanding post, and I learned a lot from it. Very timely, too, given the current kerfuffle over the F-35 fleet. Nice title, too (I liked the Joseph Campbell allusion).